This weekend the Rosa de Azafran festival is underway in Consuegra, a small town in the depths – or should I say widths, as it’s all wide open spaces – of La Mancha. I was there last year, as I was staying with a friend who lives in a nearby village, and was decidedly underwhelmed by the whole thing, I must say. The fields are a sea of purple crocus petals, which is quite a sight, I’ll give you that. A string of windmills stretches across the hill above the town, and that’s quite spectacular too, but you can see them any time. So what’s going on down in the town? Not a lot, frankly. We got there in the early afternoon on the Saturday, the main day. Usually when you arrive in a Spanish town at festival time you just follow the crowd to find the action, but there were curiously few people about. 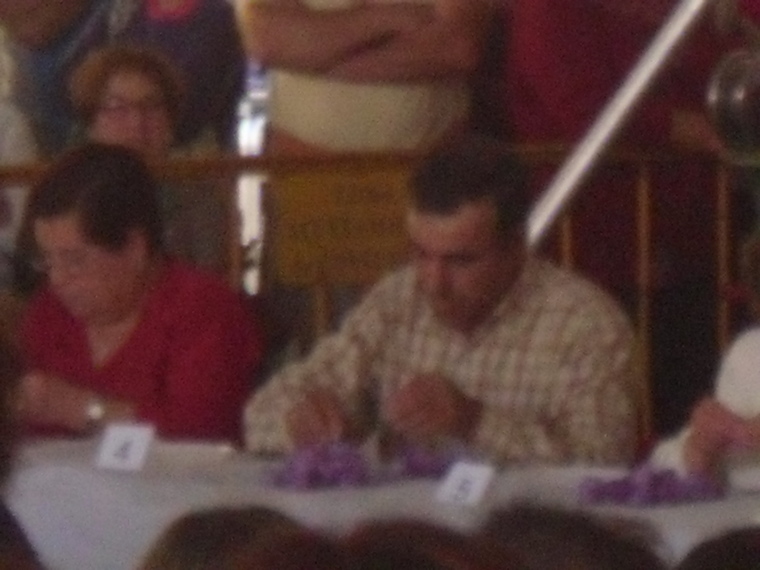 There was a bit of bunting and a marquee in the main square, which is where the competitions are held to see who is fastest at separating the precious saffron threads from the flowers, which have been handpicked early that morning. A few dozen people were sitting in rows facing a trestle table at the front, where the competitors soon took their places. This photo is pretty blurry because we were at the back, standing on a wall. I realise that having fastmoving nimble figures is quite a skill, but it’s not the most exciting thing to watch – and it’s all over in seconds. There were several rounds of this. We reckoned we’d got the gist after about 10 minutes. You need 250,000 crocus flowers to make a kilo of saffron apparently, but that kilo will literally sell for more than its weight in gold – or so the story goes. Only Iran produces more saffron than La Mancha, and the Spanish spice is considered to be the best. One of the windmills – the one called Sancho, they all have names – is set in motion to celebrate the harvest. Sancho still operates using its – or should I say ‘his’? – original 16th-century machinery, and we joined a few hundred people on the hillside to watch this symbolic event, which is called the Milling of Peace and Love. Afterwards, you can queue up to be given a little bag of the flour thereby produced. We thought we could live without that. That’s about it really. 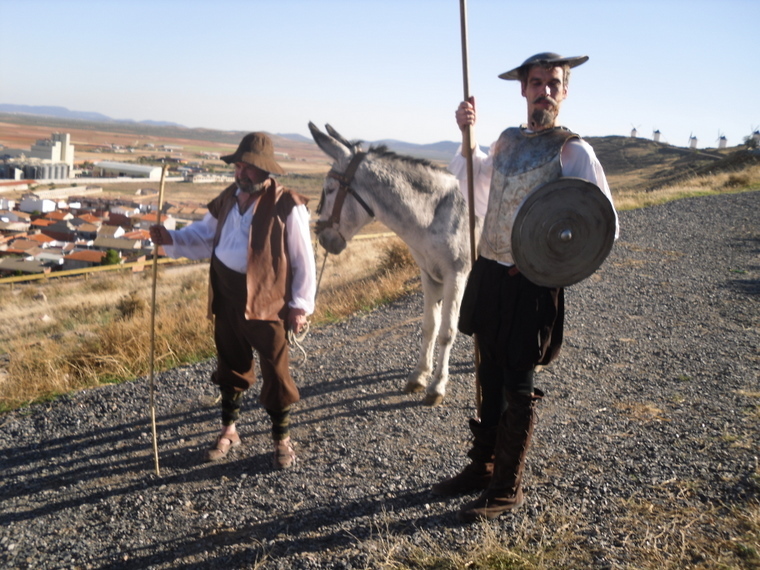 There were two blokes dressed up as Don Quixote and Sancho Panza. Well, I would have expected nothing less. 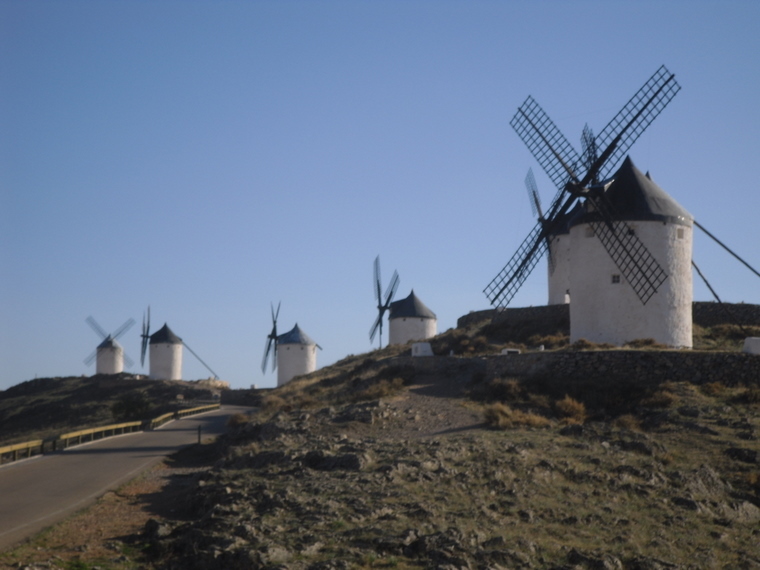 There are 11 windmills, and the first one, called Bolero, doubles up as a tourist office. I asked for a leaflet with the programme of events, still desperately hoping there was more of a festive atmosphere going on somewhere else that we’d missed. 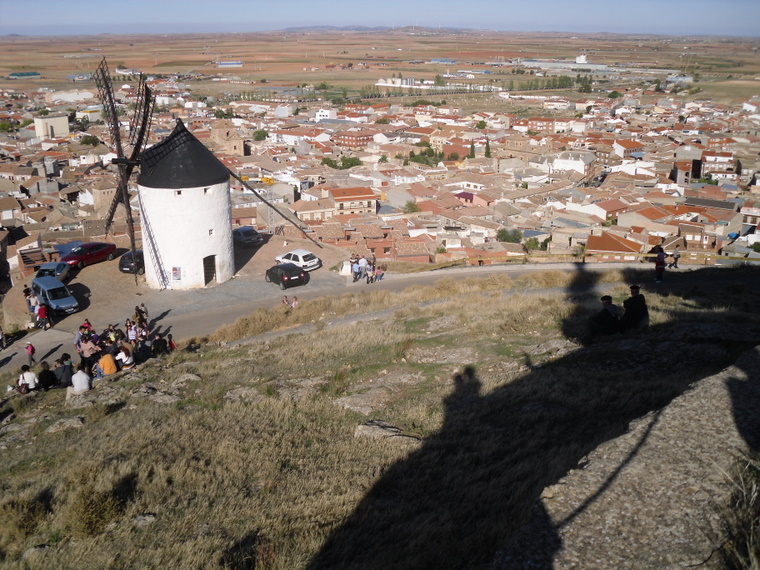 I have hazily happy memories of drunken debauchery at the Mora olive oil festival, and was convinced that something similar must be going on in Consuegra. But there were no leaflets. After a bit of rooting around in a cardboard box, they eventually handed me an A4 printout, which sadly only detailed the stigma-separating event and the slowly-turning windmill spectacle. I think there was going to be some folk-dancing too, later on, but I’m afraid we gave up and drove back across the mesmeric plains to Mascaraque, and remained happily lost in La Mancha for the rest of the weekend. Interesting festival! I’ve never had the opportunity to join in any festival in La Mancha, looks very different from those I’ve seen in Andalucia. I’ll have to visit La Mancha sometime soon! Hi Nellie. I think there’s no doubt it would have been a bit livelier in Andalucia! Although I have been to other festivals in La Mancha where there was much more of a festive vibe. Four years whilst on a shoot totally on a shoot in Valdepeñas, everyone was talking about the Consuegra Saffron festival. So, my assistant and I made a 50km detour. Same stuff all I found was a huge tent of “pleasantly plump” women on and below a stage, wildly extracting saffron stems from the same purple flowers. There was one man amongst rows of nibble fingered woman ranging form 12 to 80 something. The middle aged man was the star the star of the show. The subdued light in the tent, terrible for images. It was a serious business, of course no one kept quiet, kids running round, nobody had a programme of what was happening, the OAPs watching on intently, proud of their neighbours and I remember I big fuss about the weighing and checking. That is really interesting, Michelle, as there were quite a few men in the competition when I saw it. I was just a bit baffled that there was so little going on, as the festival gets a lot of publicity internationally, and I’ve read loads of articles about it over the years. That is not to say that the whole saffron culture thing is not fascinating, just that the festival itself was a bit of a damp squib! Hello! I was so disappointed because I’d read so much about it, but will give it another whirl when I get the chance, just in case!